Maggie went to a birthday party recently at a soap making shop (how cool is that?!). I’m almost afraid to admit that I was even more excited about the place and project than she was (not surprising given the sort of mom that I am…). What cracks me up is that she gave ME all her soap (in a lovely hand-decorated bag) because she knows how much I treasure my uninterrupted bath time, and she thinks I’m nuts for it. Who’d want to spend that much time in the tub without glow-sticks? Each of her creations has a different scent, and a couple even have toys inside (yay!). If you happen to live in Silicon Valley, you really ought to pay Opal’z in Palo Alto a visit, they even have classes to make lotions and customized make-up. It is a great party idea! 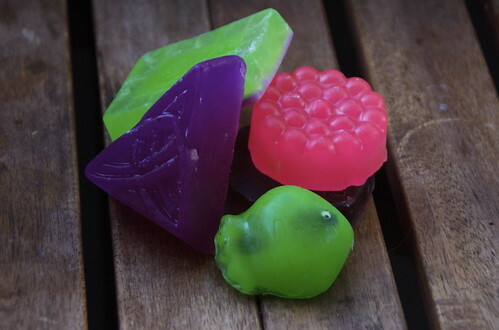 I happened upon this blog and then happened upon the pile of soaps that were made at a soap party at my shop. I am Annie, the owner of Opalz. We do soap parties or make your own lip balm parties or bath salts and lots of classes to learn to make your own presents like peppermint foot balm, bath bombs… all sorts of fun stuff. In Midtown Palo Alto. If you want to make soap at home I sell my all vegetable glycerine soap base. It is all real soap — no detergents or petro chemicals. Much better quality and a better price than Michael’s. I don’t have an on-line store, but I can ship it. http://www.opalzoap.com or e mail annie@opalzoap.com. Contact me for questions, instructions, soap base … or anything! Happy soaping!